In the selling process, it’s easy to get caught up in what we think our client needs to know. Unfortunately, what you think is important may, in fact, be costing you business. 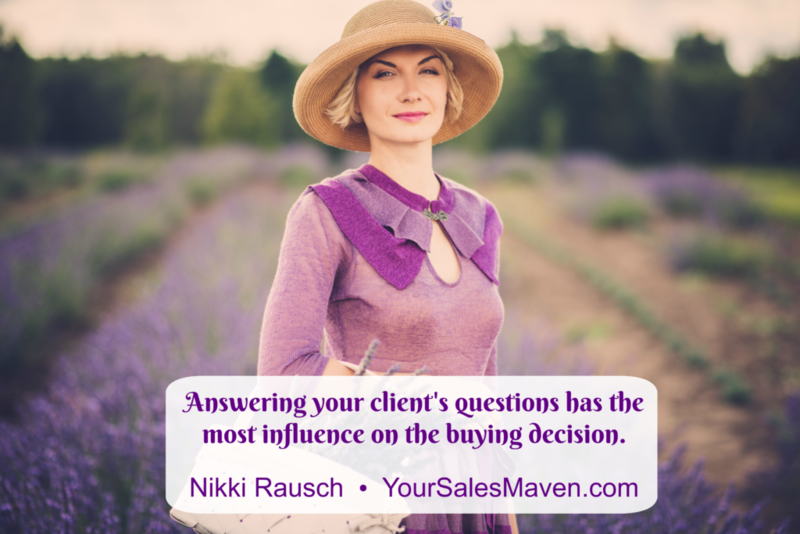 It’s actually more important to allow your client to ask questions. Based on the questions asked, you have a roadmap on what to focus on. There’s no denying you being an expert in your field. However, you’re unlikely to be an expert on how to earn each individual client’s business. The client is the expert on how to earn their business. Therefore, learning to allow for and encourage questions is what gives you the insight into closing the sale. In the last few weeks, I’ve had two encounters where the salesperson actually talked me out of buying. They weren’t paying attention to or answering my questions. In the first instance, every time I started to ask a question, the person interrupted me and continued to “sell” me on what they liked about the product. Unfortunately what they liked about the product didn’t tell me the important information I needed to make a buying decision. After the third attempt to ask a question and being cut off, I ended the conversation and decided to look elsewhere. The disappointing part was, I was ready to buy, I had my credit card out. The second instance was me making an inquiry about a specific product. The salesperson completely ignored my question about the product I came to see. She started showing me other products in the line. Even though I asked multiple questions about the product I was interested in buying, the salesperson focused on other products in the line. I ended up leaving without my questions answered and no purchase made. In both instances, I was ready to buy. The salespeople were so caught up in what they thought I needed to know they talked themselves out of the sale. Think back to the last time you lost a sale. Were you guilty of talking more than listening? Did you ignore a client question and focus on what you felt was more important? If you answered yes to the questions above, chances are this was a minor misstep for you. However, if you can think of a handful of instances where you’ve been guilty of doing this, you may have developed a bad habit in the selling process. It’s time to make a change. You are costing yourself business. You are frustrating prospective clients and chances are you’re building a negative reputation for yourself. The answer to the question above will give you the roadmap so you may focus on the aspects of your product/service that helps your client make a purchasing decision.